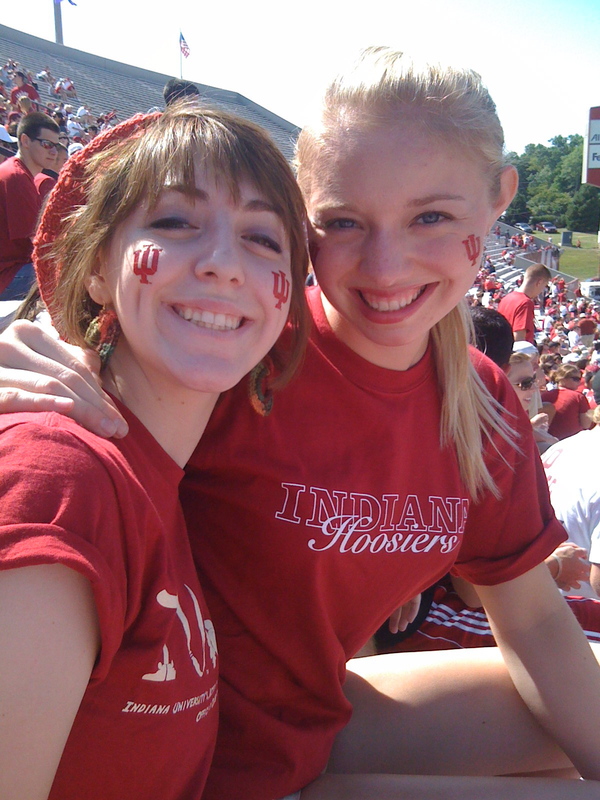 Suzie and I at our first IU football game. In the August sunlight, I sat on my deck with my laptop resting on my thighs. “When are they going to tell me?” I asked my computer. I was getting ready to fly across the country, taking with me nearly all my earthly possessions, to start life as a college student at Indiana University. My classes were already in order, my meal plan purchased. I didn’t care about when the first football game was. All I wanted to know was who my roommate would be – was that too much to ask? God must have heard my plea, because a few minutes later an email poped into my inbox with the name and email address of my freshman year roommate. Her name was Susan, but she goes by Suzie. That’s about all I knew. But that was all I needed. Just a name and an email address. A few minutes later, we were chatting on instant messenger. Even through short text our excitement lit the screen. We filled each other in just enough to know that we were sane, sweet teenage girls who were passionate about learning, exploring the world and trying new things. Our freshman year flew by, and I’m so thankful that she tolerated by 4:30 a.m. wake up calls for rowing practice, because I’m sure she wasn’t expecting that. But of course, neither was I. We were only roommates for our first year of school, but looking back on our time at IU, it was our senior year when we really connected on a deeper level. Suzie and I had changed so much since August 2008. At our graduation ceremony, we hugged each other in celebration and took our first photos as college grads. I couldn’t believe the girl standing next to me was not only my freshman-year roommate, but my friend – a young woman full of confidence, a desire to dive into new cultures, book smart, street smart, and to top it all off, she has a boatload of beautiful dreams. Cours Julien in Marseille, France. My life seems to be full of movement, mostly in the sense of travel. Here’s the story in a nutshell: my life was all ballet company (late night rehearsals, little social life, not much free time or vacations, etc.) until the end of middle school. Then one of the most special people in my life mused out loud: Hey, what if instead of doing the ballet intensive this summer you… went to France? That was it. I quit the dance company to pursue freedom of movement: kind of ironic, if you think about that. 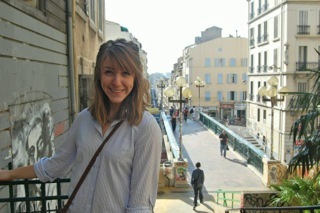 I went to Lyon that summer before high school to live with a family and got the travel bug. Ten trips to France, a few to England, a semester in Jordan (with weekend trips to Egypt, Turkey, Lebanon, Cyprus), a voyage to Israel, a primate field school in South Africa, a summer in Morocco… I can’t seem to stop. My dad says I leave the country as often as some people go to the grocery store. One and a half full passports and almost a decade later, I’ve still got the bug as strong as ever. Movement—picking up and trying new places, cultures, languages, styles of living—is very much a part of who I am. After graduating, I decided I wanted to spend some time working on my two foreign languages: French and Arabic. 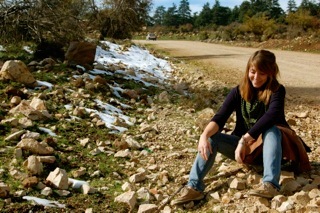 I received the State Department’s Critical Language Scholarship to study Arabic in Morocco. I was so happy to finally receive the award after three yearly attempts! So I spent the summer in Tangier studying Arabic intensively and traveling around the country, then I headed to Marseille, France where I’m currently spending the academic year with an American program studying French, Arabic, North African immigration in France, etc. We even have a weeklong “field trip” to Fez in the middle of the semester. It’s the perfect combination of programs! 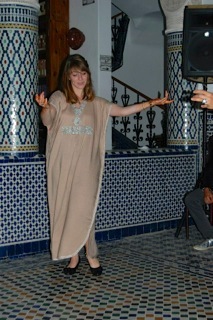 Dancing with Henna-d hands in Fez, Morocco. My goal this year is to get a good job. It doesn’t have to be my dream job: that won’t happen right away and I know of no one who was ever so lucky. But I’m talking about that job that inspires a direction. Frankly, I’m not certain at all of what I see myself doing in the future. I seem to be one of those people who has a lot of very different interests that don’t seem to add up to a certain, specific career. Or my interests lie in general pursuits like “studying languages” or “living abroad” that could be applied to a plethora of job positions. All I’m concentrating on is finding myself somewhere that inspires my next pursuit, my next move or my next great adventure. A job that adds to who I am and how I want to build my future self, that’s not so much to hope for! Probably my most prevalent thing in my life that inspires me is mastering something in a new culture or language. Having a successful exchange at the bakery or with a taxi driver without having to ask for repetition or clarification, efficaciously navigating the French visa system, being mistaken for a local by folks asking for directions (and being able to help! ), watching the guys at the phone store grasp their hearts when they hear an American girl spout Moroccan dialect, mastering a gesture that miraculously conveys what I intend, navigating the streets of a new city… All these little moments give me that prideful buzz that contributes to my love of being overseas and in another culture. It makes me realize what I can accomplish. The Egyptian Pyramids in December, 2010. The only thing that’s constant is family. As explained earlier, I love to be on the move; I love to pick up and start a new life in a totally different place. But no matter where I end up, I know I have my home base with my family. There is always going to be my bed on Old Bonhomme Road in St. Louis. Friend groups change, opinions change, styles and mannerisms and haircuts and favorite foods and the continent on which I find myself might change, but my family will always love, support, and encourage me no matter what crazy adventure I’m facing. Oh, there seems to be so many little things that make me smile. I suppose that, speaking of movement, hearing from old friends brings me joy. Like family, hearing from a friend after a long time brings a flood of memories and reminds me of all the great influences in my life and of all the experiences that have helped to create today’s Suzie. I suppose the satisfaction with the life I’ve constructed here in Marseille, France, is something more recent that gives me joy. It’s going to be really, really hard to leave at the end of the Spring. I can’t even think about it at the moment, but for now I’m focusing on getting the most out of this amazing experience as possible. Outside of the town of Azru, Morocco. Suzie, your ability to follow your dreams continues to inspire me. You never turn down an opportunity and I have no doubt that you are going to impact the world in big ways, but then again, you already are.